My adoration for Christopher Nolan as a filmmaker does not manifest blindly, despite what many people may assume as all I see around the internet is the term "fanboy" thrown out any time a rave Nolan review pops up. My eyes are open while I experience his films and if the time shall come in which his work truly disappoints, I will feel it and accept it. It just hasn't happened yet, and Interstellar certainly isn't the one to let me down. In fact, after my revisit yesterday, this time in front of a majestic IMAX screen, I am confident that this is not only the most ambitious work of his career, it is also his best. Christopher Nolan does not make flawless films, let's make that clear. I do not believe he is a one man masterpiece machine or that he walks on water, but I love his filmography and the power it has over me because the man is a grand, ambitious entertainer. He is a man of big ideas and big execution, and any flaws that may pop up during films like Interstellar or Inception are easily forgivable because I admire the desire to dream big and present a grand vision at the expense of perceived perfection. I realized long ago that I am a man who embraces the all important second viewing of a film, because for whatever reason my brain seems to process more of the details once I already know what is coming, once I am allowed to just sit back and lose myself in the ride rather than try to guess what happens next. I had minor issues with aspects of Interstellar initially after one watch, as I found parts of the film to feel rushed despite its nearly three hour running time, wishing we could have had an additional 15 or so minutes on Earth with Coop's family to really let the power of the relationships resonate. I didn't seem to notice this as being an issue this time around, and perhaps it was because I had already taken this journey once before, but I was emotionally invested quickly and the tears of Murph knowing her father may never return home broke my heart. My other key issue with the film was the tonal shift of their time on the second planet they land on, the Hoth-like beast of a world that feels more like a nightmare than salvation the second we lay eyes on it. I found the direction the film takes while on that planet to be jarring after one viewing, and perhaps it was because I didn't see it coming and I didn't expect it, because now I felt that sequence flowed just as beautifully as the rest of the work, and I understand the significance of what occurred there thematically more than before. The editing that is showcased here, as we follow both the drive of Coop to save himself and humanity and also the similar passion of his daughter back on earth as she cannot give up the fight to rescue both her loved ones and the world, is completely enthralling and beautifully handled. These two worlds are vastly different but the circumstances on them are familiar, both feeling desolate and potentially hopeless, and despite being millions of miles apart from each other, a father and his daughter simply will not give up. If you read my previous review of Interstellar, you may be surprised to see me mention any flaws at all considering how head over heels in love I was with the film then. I had these minor reservations but I still never questioned how I felt about the complete journey Christopher Nolan took me on in the cinema that night. My love for film cannot be broken down simply with X's and O's like a play design in football, it is a far richer and deeper experience than just pointing to a flaw and deducting points off my final grade of the movie. If you were to look at the trend of my favorite films over the past three years, The Tree of Life in 2011, Cloud Atlas in 2012 and then Gravity in 2013, you will find that I connected with these works on such a deep, profound level that whether or not a performance was a little off or the script could have been tweaked and so on, these issues cannot diminish what I feel internally as I let the experience wash over me. To me, cinema and art in general is all about a personal connection. You can break down every minute of a film and analyze it to death, and sometimes I am guilty of doing this myself, but for the most part I know whether or not a film worked because I can feel it in my soul. As I sit here and reflect on my second Interstellar trip, I would not be able to find a single moment that left me troubled or baffled or simply feeling off. Does that mean it is a perfect film? Hardly. For me though, for what I am looking for when I take my seat inside that theater, for what whets my appetite when appreciating the medium that has stole my heart, Interstellar is a grand, sweeping work that feels like a dream I might have that I would hope to let play out before I must wake. The incredible imagery of a ship attempting to dock in the depths of space combined with an eerie score by Hans Zimmer that seemed to always match exactly what was needed in that moment, that for me is science fiction. I have always craved exploration, a curiosity resides inside me that wants to know what can be found in every nook and cranny of not only our world, but our universe and beyond, and while no film could ever completely satisfy my desires, at the very least Christopher Nolan certainly tried. His vision lifted me out of my seat and brought me to places far beyond my field of vision, and for that I thank him. 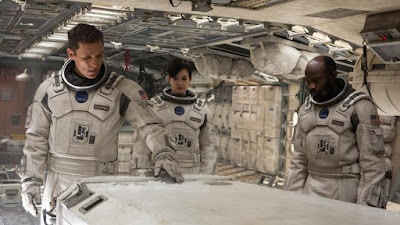 Interstellar is a film about love, and the central relationship is the bond of a father and his daughter. As I absorbed the movie into every pore, I remember thinking that I would do anything and everything, I would travel anywhere and face any danger if it meant saving the little girl that I brought into this world. Try and tell me why I shouldn't love this film, go ahead, your case might be incredibly valid and well reasoned, but in the end it will not work. When cinema speaks to me, I listen. Interstellar has spoken.